IT ALL BEGINS WITH THE PHYSICAL. Did you know that the way in which data is presented to us can have an effect in the way we absorb and retain the information that we are working on? Similarly, the way in which we condition our posture can determine our level of injury when doing even a simple task such as reaching over to turn off our alarm clock in the morning. These facts were determined from the study of ergonomics which became a science in the early 19th century to examine the environment around a worker with the goal of increasing productivity. While there is not a lot that we can do about the way that information is presented to us, we certainly can do something about the condition of our posture. For the short term, we may experience discomfort and some small strains, but the importance of proper posture becomes more evident in the long term. As more of us sit at a computer for many hours in the day, it is important that we take the time to have an ergonomic assessment, incorporate breaks throughout the day to stretch, and find time outside of work to exercise and recondition our bodies. Most of us sit in an office all day long with our hand on a mouse and a keyboard, our neck stretched out reading words on a bright screened computer, and with our legs bent at a 90 degree angle at the hip. It is no surprise that we end up walking around with a pike at our hip area, our neck outstretched and our backs rounded in poor posture. As human beings, we are not built to be sitting in a chair in this position hour after hour, day after day, and year after year. Our bodies are built to be upright and moving. Chronic poor posture, inactivity, and improper use of a keyboard and mouse may have numerous negative effects on our health and physical well-being. These negative effects can wreak havoc on our physical and emotional quality of life. 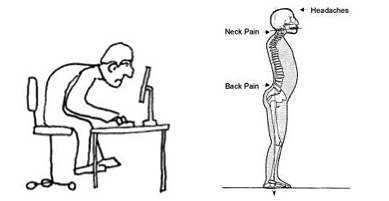 In addition, poor posture can have a negative effect on the way we feel and the way we look. 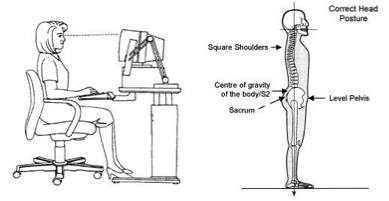 For the most part, if we are slouching or using bad posture at our desks, it is not necessarily our fault. It typically means that the furniture and equipment that we are using are not set up for our individual body types. Small adjustments can help avoid big problems. But in addition to that, there are actions we can take on our own, both while at work and outside of work, to ensure proper posture. Awareness: Simply being aware of our posture helps us to sit properly in our chairs as we work and helps us to improve our stance and walk. Core exercises: Focusing on cores exercises will help support a proper alignment in the body. Many people think that the core includes only the abdominal muscles. In fact, our core supports our spine from the top of our neck, to the end of our tail bone. Consult with a personal trainer or a physical therapist for exercises to focus on. Cardiovascular exercises: A cardio workout strengthens our heart muscle and improves our circulation. But remember to do all cardio exercises with awareness of proper posture. Yoga: Many yogis have fantastic postures. This is because each pose is designed to strengthen the core, balance the muscles, and improve breathing. When done correctly, a daily yoga practice will greatly improve any muscle imbalances and relieve muscular skeletal disorders. Walking: Taking a 30-minute brisk walk while being aware or our posture will help to strengthen the muscle memory of proper posture. Breaks: We should be taking frequent breaks throughout the day to stretch out our legs and our chest and to roll our neck and wrists around. There are many reasons to maintain proper posture. In the first place, we all look better, more confident and happier when we stand up straight and tall. But while looks are fabulously important, our health is even more so. Having proper posture helps alleviate deteriorative issues as we age. When we have proper posture, our organs, our muscles, our joints and our bones are in proper alignment. This alignment supports us throughout the day to move more efficiently and avoid injury. In addition, we breathe easier, have better blood circulation, and improve our concentration and thinking. So as we set out each day, let’s remember to exercise, walk, and sit with proper body alignment. It’s a great way to be taking care of our health and we will look and feel terrific in the process.